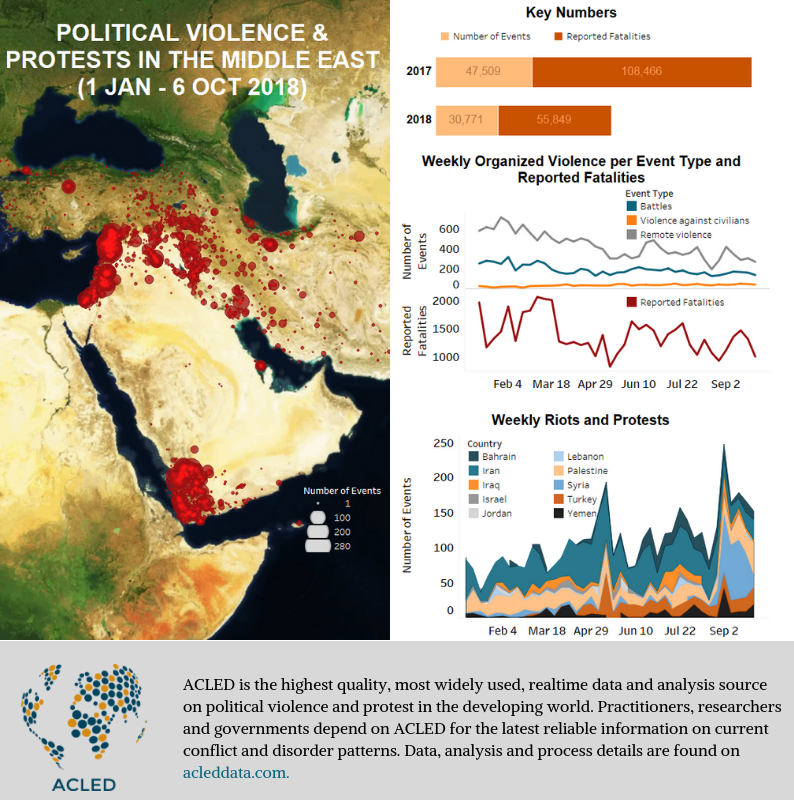 Throughout the Middle East last week, rates of political violence and demonstrations have generally decreased compared to the week prior, with fatalities also decreasing as a result. In Gaza, demonstrations and border violence continued, spreading to the West Bank and Israel. In Iran as well, demonstrations and strikes revealed the country’s ongoing economic crisis. In Iraq, the Kurdistan elections passed peacefully, while in Syria and Yemen years of conflict have led to increased civil unrest and talk of separatist movements, particularly in southern Yemen. In Gaza, five more Palestinians were killed in clashes with Israeli forces last week as demonstrations and cross-border violence continues. In addition to the weekly Friday demonstrations across the territory, demonstrations at sea have also been occurring with regularity on Mondays off the northwestern coast of Gaza. The sea demonstrations are similar to those on land, complete with floating tires set alight. They have been met with heavy resistance by Israeli forces both at sea and along the beach. Meanwhile, a number of articles have stated that Gaza’s economy is in freefall and unemployment is soaring to 70% (The Independent, 25 Sept 2018). This continues the worrying trend of increased conflict and deteriorating conditions. Similarly in the West Bank, Palestinians commemorated the killing of thirteen Palestinian citizens of Israel in 2000 during the second intifada, leading to a high number of violent interactions between demonstrators and Israeli forces. In both Palestine and Israel, Palestinians held a general strike in commemoration of the event on October 1, as well as protesting the Israeli Nation State law and the discrimination faced by Palestinian citizens of Israel. On September 30, Iraq’s autonomous Kurdistan region held its first parliamentary election since the failure of its 2017 independence referendum and the end of the Iraqi Civil War (Middle East Monitor, 1 Oct 2018). Despite concerns that the election might spark an increase in Islamic State (IS) attacks or violent internal disputes, no such events have been reported. However, with preliminary results showing a major Kurdistan Democratic Party (KDP) victory, claims of fraud by the opposition parties – especially the KDP rival Patriotic Union of Kurdistan (PUK) – mean the results are likely to be rejected (Basnews, 8 Oct 2018). Meanwhile, IS IED attacks have increased throughout the country. Civilians were targeted in a number of these incidents, particularly in Baghdad and near the al-Siniya oil refinery in Beiji district where an employee bus was hit by an explosion. In the north, both Iran and Turkey continued to launch non-sanctioned attacks on Kurdish insurgents in the region – namely the Democratic Party of Iranian Kurdistan (PDKI) and Kurdistan Workers’ Party (PKK), respectively. PKK also continued to battle Turkish military forces in southeastern Turkey. On October 4, eight Turkish soldiers were reportedly killed when PKK militants detonated an IED in Gercus district of Batman (Hurriyet, 4 Oct 2018). Fighting also occurred in nine other provinces in the region, leading to twenty-two reported fatalities. Elsewhere in Turkey, a number of demonstrations took place this week across the country for a variety of reasons. Among them was a protest in Istanbul addressing the disappearance and death of Saudi journalist Jamal Khashoggi, who was last seen entering the Saudi consulate on October 2. The Turkish government has requested a search of the consulate and has accused Saudi Arabia of murdering the journalist — an accusation that Saudi Arabia denies (BBC, 9 Oct 2018). In Iran, the economic crisis continues to spur protests across the country following renewed US sanctions which have exacerbated the problem (Bloomberg, 9 Aug 2018). In the past week, labour demonstrations and national labour strikes occurred, mainly due to low or unpaid salaries. The largest of these strikes is being led by truck drivers who have been protesting intermittently since May 2018 against their inability to replace their truck tires due to high costs. The strike has led to disruptions in fuel distribution across the country, creating long lines at gas stations in many cities. The Iranian authorities arrested at least 244 truck drivers in various provinces last week for participating in the strike. As of October 9, shop owners and labour groups have joined the truck drivers’ strike (Asharq al Awsat, 9 Oct 2018). In Syria, clashes occurred between Hayat Tahrir al Sham (HTS) and National Liberation Front (JTW) fighters in the western countryside of Aleppo. This is following an attempt by HTS to arrest civilians in Kafr Aleppo village, who turned out to be members of the JTW splinter group Nour al Din al Zinki Movement (HNDZ). Both groups – who have a significant presence in the rebel-held northwest – agreed to stop fighting after two days. Meanwhile, clashes continued between Syrian Democratic Forces (QSD), along with their Global Coalition allies, against IS in Al-Bukamal district of Deir ez-Zor governorate. However, no significant territorial gain was achieved. IS militants also clashed with regime and allied forces in the Tulul Al Safa area of rural Damascus. This is amid reports of breakthroughs in the negotiations between both sides regarding the women being held hostage by IS following their attack on As-Sweida in late July. In Yemen, fighting continues to rage on the western front of Hodeidah governorate, with constant clashes occuring in the districts of Hays, Bayt al Faqiah, Tuhaytah and Durayhimi between National Resistance Forces and pro-Houthi forces. In Bayt al Faqiah, it was reported that pro-Houthi forces had advanced as far as the sea in the Al Jah area, which, if true, would mean that the National Resistance Forces have been cut into two armies. Meanwhile, fighting is still ongoing on the outskirts of Hodeidah city, but no major breakthrough has taken place on either side. In the south of Yemen, demonstrations increased last week within a majority of the regional governorates. Demonstrators gathered to demand solutions to the deteriorating economic situation, clashing with police near Sanaa University and blocking roads with burning tires in Aden, Taizz, and Lawdar. Otherwise, the majority of the demonstrations have remained peaceful. Meanwhile, in Al Mahrah governorate, a large protest took place on October 5 calling for the departure of Saudi forces from the region. The presence of Saudi jets in the area has added to the already increased tension following a recent statement issued by the UAE-backed Southern Transitional Council vowing to organise an uprising (Reuters, 3 October 2018). Security forces have since then been on high alert, especially in Aden, where armoured vehicles have been deployed throughout the city to secure strategic sites. Additionally, as many as 500 soldiers are believed to be making their way from Marib and northern Shabwah to fill in the pro-Hadi ranks in Aden.